Parantava äänikylpy vie kuulijansa syvään rentoutukseen maagisine instrumentteineen. Musiikki­sessiossa muun muassa 4 eri planetaarista (isoa) gongia, kristalli­­kulhoja, viulua, laulua, tibetan singing bowl -äänimaljoja, enkeli­kelloja sekä muita eksoottisia hoivaavia soittimia. Inspired by the pulse of nature, people and ancient galaxies, allowing us to peek into the marvellous world of the fairies and opening doors into the birthplace of sunrise. We offer You vibro-acoustic relaxation sound massage and organic music. In our sessions people are lying on a soft plaid and feel deep relaxation. 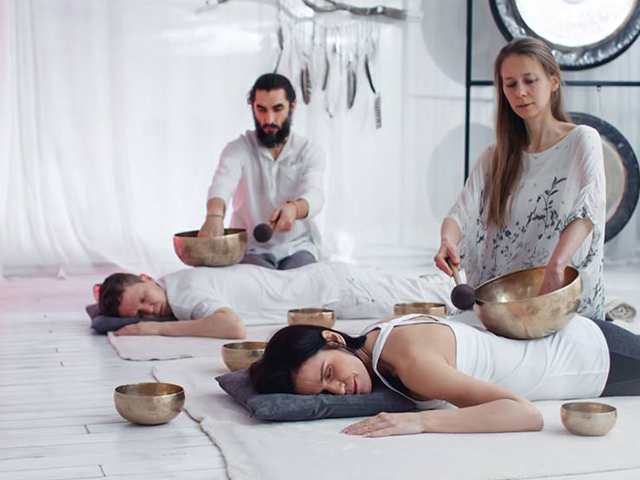 GONG – one of the world’s oldest instruments, will help You achieve a deep state of relaxation. According to Oriental philosophy, Gongs organic sounds help to get rid of fear and other negative emotions. Gong sounds will clear and balance the brain waves. This will contribute to increasing creativity and multiplies the activity of the immune system. Our brain works at certain frequencies. There are five different frequencies, as we know, at which our brains resonate. These are called Alpha, Beta, Delta, Gamma and Theta waves. The Alpha brainwave state (8-12Hz) is the frequency of daydreaming and imagination and is quickly achieved. In Theta stage, a state of deep relaxation, the brain wave activity slows 4-7 cycles per second. Theta waves belong to our subconscious. This is the place where our memories and experiences are stored. Theta waves are predominant when a person experiences creative impulses and inspiration. In real life we experience Theta waves every night. This usually occurs for about 30 minutes during sleep. As the mind and body relaxes, the brain enters Theta state (4-7 Hz: deep meditation and psychic awareness). Theta is an ideal level of consciousness for healing to occur. Gong allows us to stay in the Theta state as long as we play it. This is a practice of which every human being is capable. You do not need to ”know how” to meditate, just lie down and let yourself stay without prejudice and allow yourself to accept this experience with gratitude. Huom! Varausjärjestelmään on mahdollista tehdä varauksia aikaisintaan 5 viikkoa aiemmin.